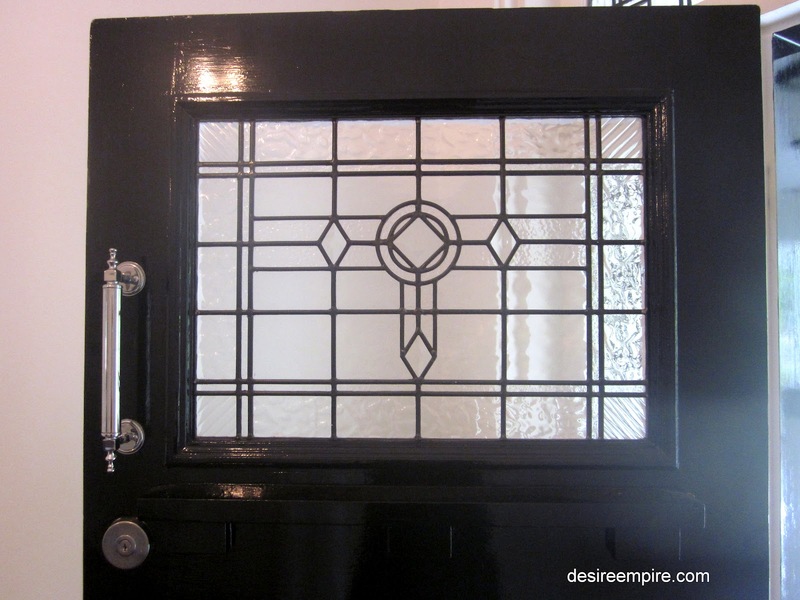 Today we are talking entry foyers and we are talking entry foyers in black and white. I am sure you will remember Nicole's lovely Hamptons renovation in blue and white, Her open plan kitchen/ family room, was a completely new addition to the house and called for a more modern style of furnishing. 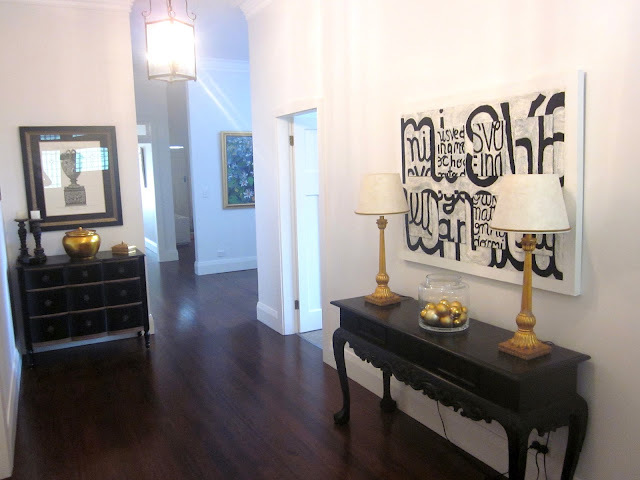 Her entry foyer, by contrast, is part of the original 1920's house and was given a more traditional treatment. Nicole loves contrast in her decorating and I believe one of the most affective ways to achieve that, is in the use of black and white and I think she's nailed it here. The black furniture provides clear definition against the white walls and creates an impression of space. The high ceilings with beautiful lantern style lighting draws your eye up, which adds to the spacious feeling of the foyer. The gold accents add interest and yet another contrasting layer. When I entered the foyer for the first time, I immediately knew I was in for a treat and it created excitement and stimulated thoughts of what other treasures would unfold, as I viewed the house. It lifted my expectations and made a fabulous first impression. Even the shiny black door was impressive and gave a hint of what was to come in terms of colour and style. Black and white can look great in a small area as well. 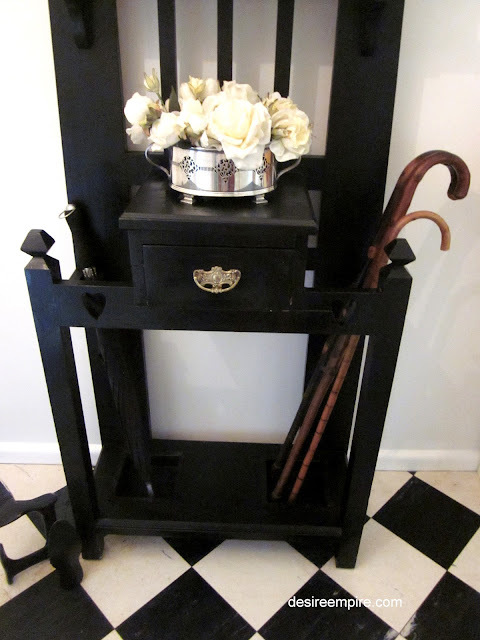 My mother has a small foyer which is furnished in black and white. 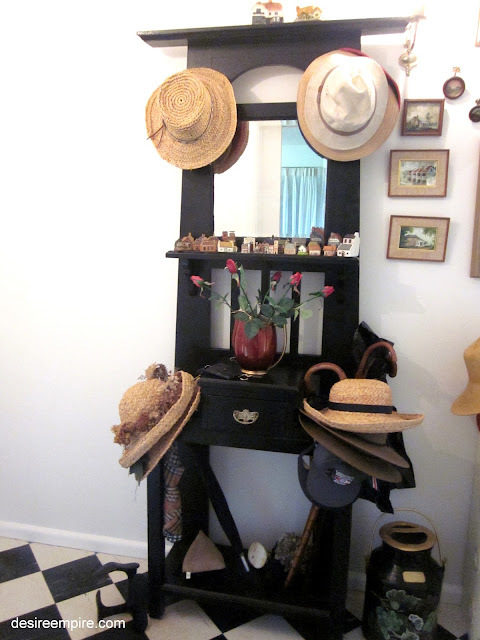 I did a 10 minute hall stand make over for her the other day and I think the declutter improved the look of the room. 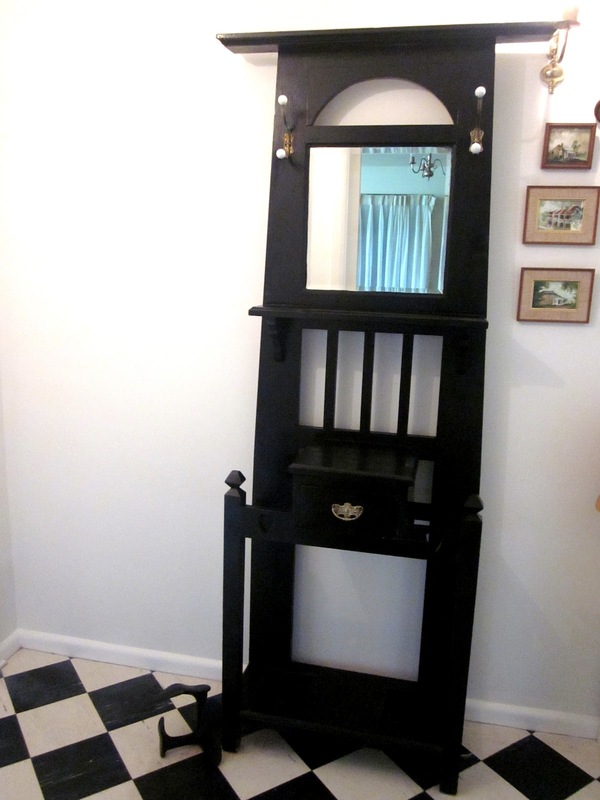 My mother, collects many things and this hall stand is evidence of that. There are 4 collections laid out right here, hats, walking sticks, miniature houses and an art gallery of period houses. I cleared everything off the hat stand and only put back the essentials. As you know my forte is working with what I have. It's easy on the budget and is kind to the environment. The red roses had to go and they were replaced with a beautiful silver bowl of white roses, which compliment the gorgeous chequered floor tiles. The miniature houses were replaced with some silver framed vintage family photographs and some sweet little silver ashtrays my mother picked up on her way through Egypt in the 1950's. I put back several of the walking sticks, one umbrella and a straw hat. 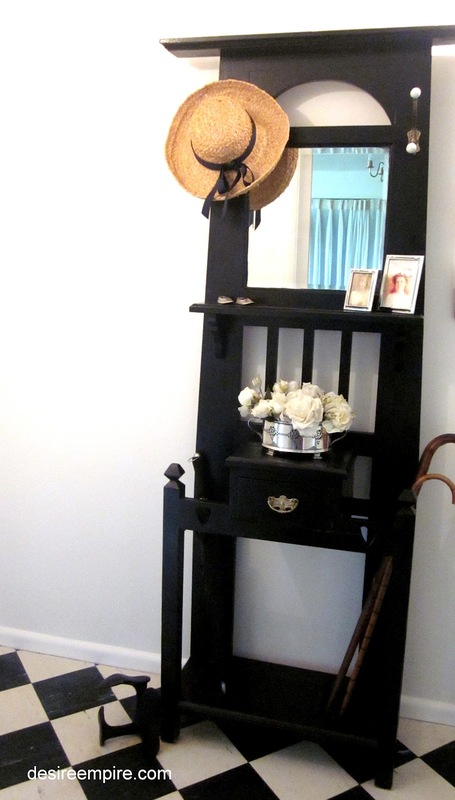 Here at the Beach House we do not have a foyer but I love black and white at the entrance to a home, so that is the way I am going on my ever so slow, snails pace deck redo project. 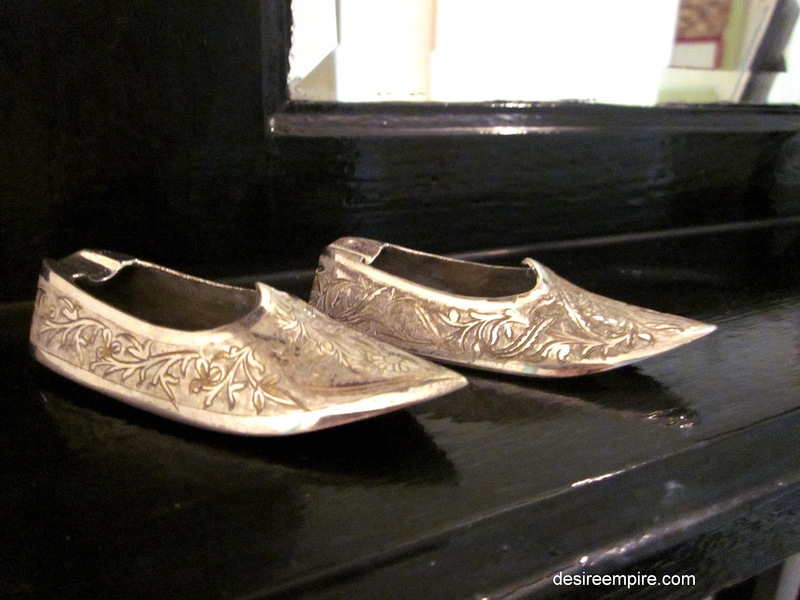 Blogger seems to be up to her tricks again. My new posts are not showing up in my GFC follower's dashboards or on the blog rolls that my lovely readers have put me on. I usually post on a Monday, Wednesday and Friday morning Sydney time, so be sure to check back if you don't want to miss something. Hopefully Google fixes this soon. 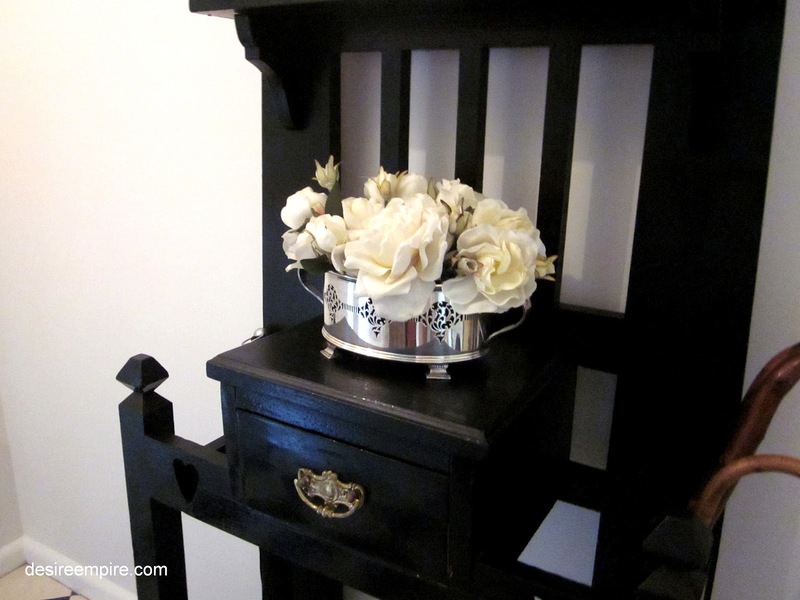 Love the results with the sweet silver slippers and the roses in the silver vase. Very elegant. And the hat adds the charm. I love the black and white. Very cool. Thanks for sharing at DIYbyDesign. Gorgeous! I had black and white in my entry but just went to more color. I adore black and white! Love that hall tree...so pretty! I adore black and white and with a touch of gold perfection. Your mother's hat stand definitely proves that sometimes less is more...wonderful touch!! I love love love black and white color combinations. You can add any color to it and it always looks so sharp! Love the touches of gold as well. And I love the chalkboard headboard! Great job! I spy a piece of artwork on the wall that I just love! New to your blog and glad I found your little creative space on the web:D Happy Wednesday! i really really really quite love that chalkboard surfboard. so super cool. Beautiful! Love black and white together! So crisp! I'm always a lover of black & white! I discovered you on Artsy Girl Linky Party and I’m now a follower; I would appreciate you following me back. This is fabulous and quite elegant. I love everything you have done. I would love it if you would share this amazing post at our WIW linky party. I hope you can join us. Absolutely adore your black and white! It's so crisp and elegant! Thank you for sharing at Potpourri Friday! 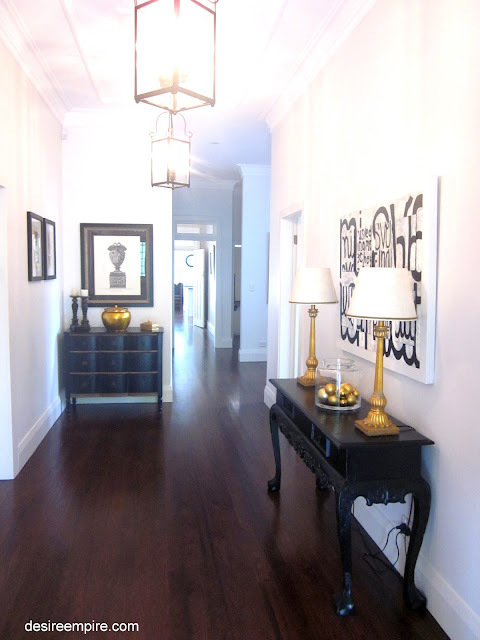 Love the light fixtures in the first 2 pics...elegant! 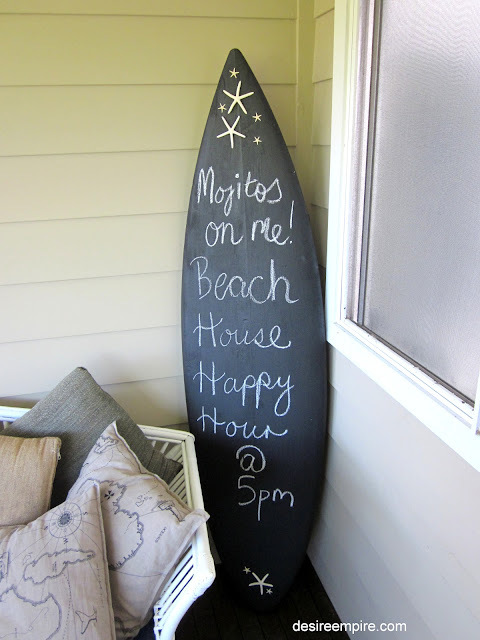 Love the black and white and your surf board chalk board! Stopping by from Seasonal Sunday, and I love the black and white combo. I have many pieces of the (black and white) Mackenzie Childs courtly check. Thanks for the inspiration! Black and white is definitely eye catching and is wonderful because it can be sophisticated or playful. The changes you made in your mother's foyer certainly demonstrate that. If I can get there by 5, I'll join you for a mojito. There are so many things I love about your foyer. The black furniture is really dramatic. Very impressive transformations. Very elegant. You just can't beat black and white, can you?